Idles about and playfully barks. It's not completely random. 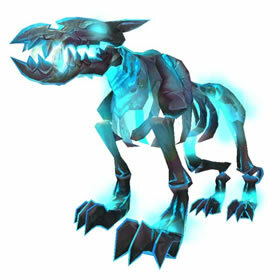 You have a chance to get this if these type of dogs spawn on your island. They did on my island just now and this dropped. That's how most of these pets/mounts work. They have a chance to be on your loot table if you kill the special version of them. The most important thing to kill seems to be the invasion mobs that spawn toward the end, they have a nice loot pool from what I can tell. Now you no longer need to kill the mobs that will unlock the loot table in order to get this pet, you only need the mob to spawn on the island which is so much better and easier to perform islands! not seen it yet!